Gauges 9-11-16-24w-32w-42w. Nickel. Developed in conjunction with some of the world's top artists, Roto Pinks Super Light Electric Guitar Strings deliver a smooth powerful tone that lasts when other strings have long since gone dead. Superb brilliance and strength make Roto's the first choice for the professional. 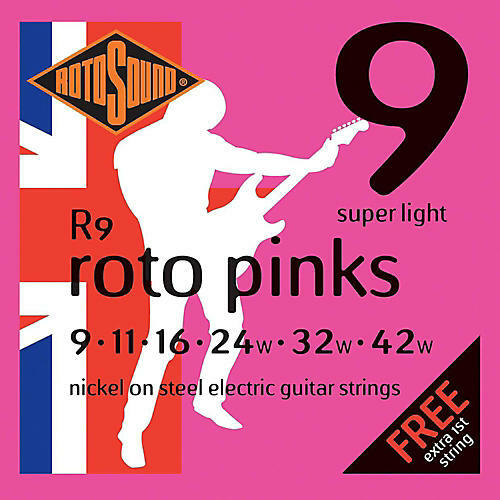 Developed in conjunction with some of the world's top artists, Roto Pinks Super Light Electric Guitar Strings deliver a smooth powerful tone that lasts when other strings have long since gone dead. Superb brilliance and strength make Roto's the first choice for the professional.